If you ask ten different people what their favorite food is for Thanksgiving there’s a good chance you could get ten different answers. Ask my youngest daughter and you’ll probably get one of two answers. She’d either say her Grandma’s homemade rolls and strawberry jam or fresh cranberry relish. I don’t remember having cranberry relish or sauce on Thanksgiving growing up. If we did I’m betting it came from a can. Fresh cranberry relish is a staple on Thanksgiving at my in-laws house, and like my daughter, it has become a favorite of mine. The cool thing is it’s really easy and inexpensive to make. A couple of bucks and 15 minutes and you’re done. Here’s the recipe I use, modified slightly from the one you’ll find on Ocean Spray’s website. Use a food processor to evenly chop the cranberries. You may need to do it in batches depending on the size of your food processor. Chop until the pieces are about the size of a grain of rice and put into a mixing bowl. Wash, core, and quarter the apple. 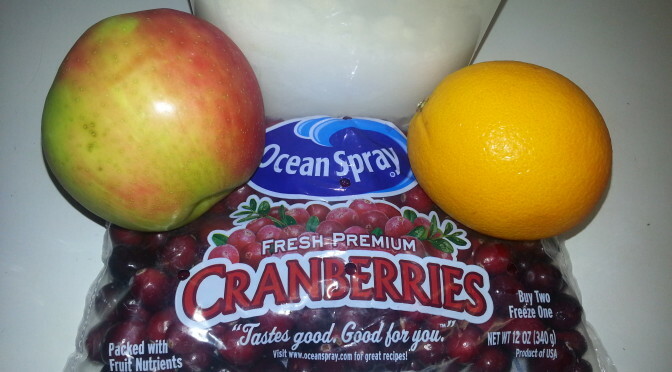 Chop it up in the food processor and then add to the cranberries. Wash the orange and cut into 6 – 8 pieces removing any seeds. Next, use the food processor to chop it, peel and all. Add to the mixing bowl and stir into the apple and cranberries. Now stir in sugar to taste. I start with 3/4 cup and add more if needed. Cover and refrigerate. It makes 3-4 cups and keeps up to 2 weeks (but you’ll probably eat it all way before then). You can also freeze it. That relish sounds good to me — not so much for my family — always a favorite is stuffing — not dry, but moist — also my mom always made a cranberry salad with marshmallows and whipping cream — and pineapple — really good!!!! Noralee, Paul’s mom always made that cranberry salad recipe, now I make it every year. I love it! I’m a stuffing fan too… as long as there’s no fruit in it. Have a great Thanksgiving!